Today’s conventional medicine focuses on attempting to treat disease after it happens. What is unique about us, is that Ocean Chiropractic and Health Center emphasizes on improving your health in an effort to reduce the risk of pain and illness before it begins. If possible, most individuals would rather enjoy being healthy and avoid illnesses. At Ocean Chiropractic and Health Center‘s, Fort Pierce location, this is something we strive to accomplish by educating the public and our patients. There are studies being conducted that suggest chiropractic may be more popular and successful than visiting your family physician in regards to lower back pain. Some individuals are seeking an alternative to traditional medicine. Alternative medicine can sometimes help people achieve and maintain optimal health. Take a moment to learn about us! Introduce yourself to chiropractors Bradley Deiner, DC and Jennifer Carter, D.C. and the welcoming team that are dedicated to assisting you achieve your wellness objectives. 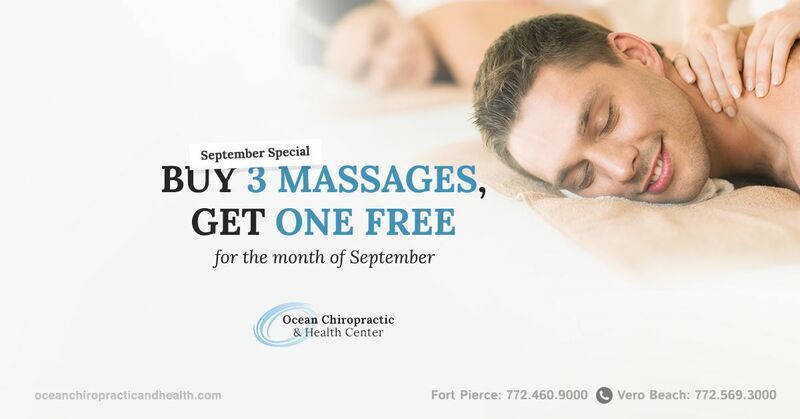 As a patient at Ocean Chiropractic and Health Center in Fort Pierce, we will personally customize a wellness program specifically targeted to your chiropractic and wellness needs. At Ocean Chiropractic and Health Center we want you to be comfortable, pain-free and offer you the education on how to achieve optimal health for yourself. Please take the time to learn about us!